It is the unmistakable screech heard round the world. By now, you’ve surely seen that looping video, strung together from the good citizens with cell phone cameras who have learned that video doesn’t lie (below via Washington Post). It loops on all your newsfeeds and on TV like a modern Zapruder film. Or a Rodney King video. If you haven’t seen the video, then maybe you’ve heard it? 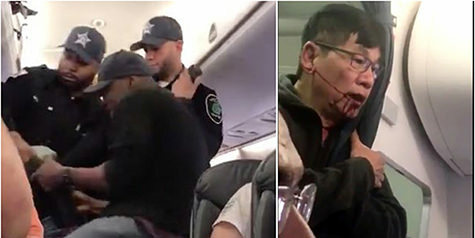 While the video shows how a 69-year-old Asian American doctor named David Dao was forcibly removed from his seat on United Express Flight 3411, it’s the sound he makes that, for me, is the most alarming. The pictures may lure your eyes, but the screech is what haunts and makes the video so much harder to watch. Even when TV reporters talk over the looping video, the sound never goes away. Even when muted. I can hear it as I type–it’s that shrieking cry of agony. Anyone who has experienced a transgression of any kind–racial, sexual, personal–has heard it. Maybe you’ve made the same sound yourself. And, of course, my heart dropped when I first saw Dao’s bloodied Asian American face. Actually, it looks and sounds like he was in agony. But the CEO’s remark sets up the antagonistic stance the company wants with the American consumer. Already, news reports are circulating putting Dao in a bad light, setting up a typical “he’s no saint” defense. The Louisville Courier-Journal reported this morning on Dao, an Asian immigrant who went to medical school in Vietnam in the ’70s and worked in a Louisville-area hospital. According to the news report, Dao was arrested 14 years ago in Kentucky in 2003 and convicted of drug-related offenses after an undercover investigation. He was placed on five years of supervised probation in 2005 and allowed by the state board to resume practicing conditionally in 2015. And that’s where life found him Sunday night. A good doctor eager to get home to deal with patients. Of course, it must be noted, Dao’s past has absolutely no relevance to the present. The relevant facts are that Dao was on an overbooked flight and was “bumpable.” He was entitled to up to $1,350 in compensation. Dao wasn’t entitled to the physical abuse meted out by airport police, who indelicately pulled him out of his seat and dragged him through the aisle. It looked like police dragging off a protester at an act of civil disobedience. Then there was Dao’s loud shriek, his painful cry for help. Or as an alarm to all consumers? On Twitter, I wondered if Dao would have been treated differently if he were white? Would he have been allowed to walk off with dignity? Or did the Chicago aviation security officers bully him and use force because they saw him as a slight, older Asian male, who could be taken out with force? I have no doubt that it would have been worse if he were African American or Latino, or even South Asian or Muslim. I also tweeted that maybe a competing airline would start a “No Drag, leave with dignity” bump fee. But that’s just me thinking that customer service still counts in our corporate-infested, money-first society. A lawsuit? That’s what the corporation seems to be gearing up for. For me, nothing short of free or discounted flights for a certain period for all, or maybe a lifetime for one passenger in particular, will redeem the corporate bosses at United for its transgression against Dao, who would not go gently off that plane. That’s my free crisis PR advice. Any amount of free travel would still be dirt cheap for United/Continental, whose actions against Dao on Sunday sent its stock tumbling 3.7% Tuesday morning, on a pace to wipe out $830 million in market capitalization. It’s a relatively small amount for a company reported to have a $22.5 billion market value. (A fraction of what Apple’s worth.) But that’s the bottom line corporations understand. United needs to understand more than that. If it doesn’t apologize and soon, United risks handing over a few airplanes, if not the airline itself, to Dr. Dao. That’s how bad this is. I’m personally avoiding United until I hear something different. And I recommend you take that action too. Maybe United feels emboldened by the pro-corporate nature of these Trump times, that backs insurers over people and doesn’t blink about putting 24 million without health care; that puts shareholder profits over all; and values a person’s success only by his bank account. More important than money is the real capital that gives life its meaning–people. United is about to find out that it would make more money simply by treating customers like Dr. Dao as human beings worthy of respect and dignity. Until it does, we all need to keep screeching.